Hurry up and take advantage of Extang promotion at CARiD! - Ford F150 Forums - Ford F-Series Truck Community. Hurry up and take advantage of Extang promotion at CARiD! Owning a pickup truck means being able to haul just about anything and keeping your cargo safe sometimes becomes a real challenge. A good and reliable tonneau cover will save all your cargo and protect it from thieves. 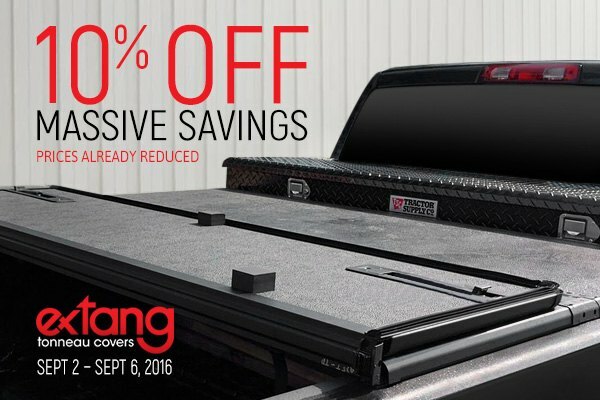 Extang tonneau covers are dependable and feature sleek aerodynamic design, that reduces wind drag by leveling out the top of your truck bed. Made of high quality materials, the black vinyl tarp with integrated black snap tops is resistant to fading, tearing, and cracking even in the most extreme conditions. Feeling that your Ford truck is ready for this upgrade? I's a perfect moment to act! Purchase any Extang product and SAVE 10% OFF. Prices are already reduced. This offer is valid from September 2 through September 6, 2016. PM me today for a quote or leave your comments below. February promotion from T-Rex at CARiD! Stop wasting your money on shipping charges with Westin Promo at CARiD! Quick Reply: Hurry up and take advantage of Extang promotion at CARiD!